Applications: Tapered aluminium oxide abrasive caps are ideal for grinding and deburring in hard to reach areas where the conical shape would be useful. They are suitable for use in tool manufacture, for molds, precision mechanics, model miniature making, aerospace and other industries. Product Notes: Abrasive tapered caps are quick to change and available in a selection of grades and sizes. It is also possible to work on the crosscut side of the cap. 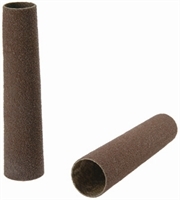 Also Available: Abrasive cap holders are available for tapered caps, please follow the link.